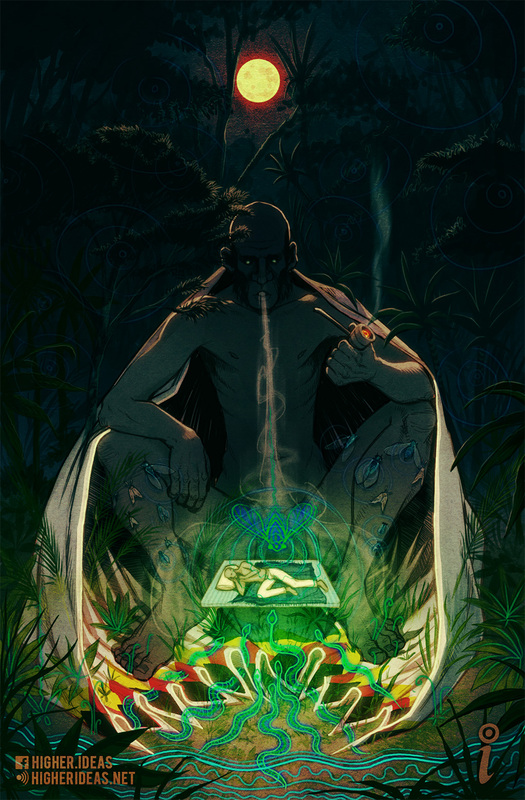 This piece tries to capture one of the most spectacular Ayahuasca full-sensory visions I’ve ever had. Last week I sat alone in the jungle, in isolation, waiting for the brew to kick-in for the night. It all started with the sound of massive human footsteps approaching my camp, out of the woods. With the sound of cracking branches and deep rumbles of weight, he arrived. A giant! His huge feet stepped closer, sending the bottom edge of his cape over my head like a giant umbrella. Then, once my camp was cloaked in his great cape, he sat down just next to me. ‘Whoooommmm’ the ground shuddered. In his silent company I felt no fear, no trace of threat; this was by all means a gentle giant. I felt safe, surrounded by his white cape and his great limbs that would surely ward-off any unwelcome guests that night. The best bodyguard imaginable! Then from the shadows I felt his massive hand reach my way, only to pass-me-by as he grabbed at some pouch that sat on the ground beside us. Out from it he pulled a pipe, from which he then took great puffs of smoke. With every inhale, the coal in his pipe glowed bright, revealing a wise sparkle in his eyes and only hints of his shadowy face’s forms. With every exhale, his magic smoke came at me, shifting the texture of the air and reality around me. Protection. Power. Medicine. It sent me into spirals of deep visions and called other good spirits our way. That whole night went on, under the watch of this amazing spirit. This gentle giant of the forest who just happened to be passing-by. It was a ceremony I’ll never forget. ‘i’ is an Ayahuasca apprentice, podcaster, and writer – Currently working at a dieta center near Tarapoto, Peru.